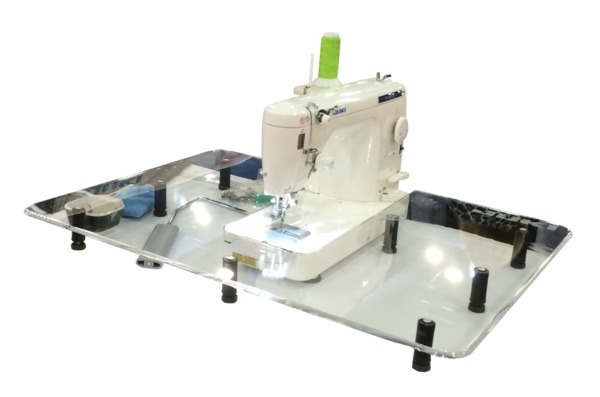 For all longer bed Portable Freearm or Flatbed Sewing Machines, Convert your portable sewing machine into a sit down free motion sewing machine with this easy to use Sew Steady Free Motion Table. This 24” Deep x32” Wide Table offers an excellent surface for all free motion work. This table comes with 8 removable legs. Includes 2 x 16” cling rulers, and a silicone based polish kit which turns your table into a slick surface ideal for free motion quilting. The Sew Steady table is built-to-order to fit your specific machine. Please allow 2-5 weeks before shipping and expect a delivery time of 5-7 days. It is well worth the wait! 1. Adjust leg height to be 1/4” shorter than machine free arm. 2. Install legs by placing Table upside down on a firm surface. black buttons attached to Table. Turn Table upright. not slide into place correctly). protected surface and gently wiggle legs back and forth. *Sew Steady Free Motion Table 32x24" for Home Sewing Machines. The longer your machine arm, the closer to the end of the table the needle will be. If your machine arm is too short, you may need to stand up to reach the needle comfortably with your arms and hands. We recommend a smaller table if the needle is over 10" from the end of of the table. Note: This table was designed for machines with free arms longer than 13” overall length (not needle to neck) If you free arm is shorter than that this size of table may not be ideal as the needle will be more than 10” from the front of the table. 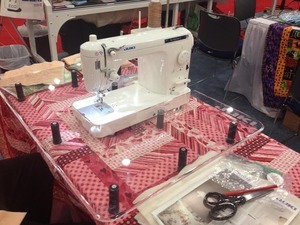 Convert your portable sewing machine into a sit down free motion sewing machine. This 24" deep by 32" wide Table offers an excellent surface for all free motion work. 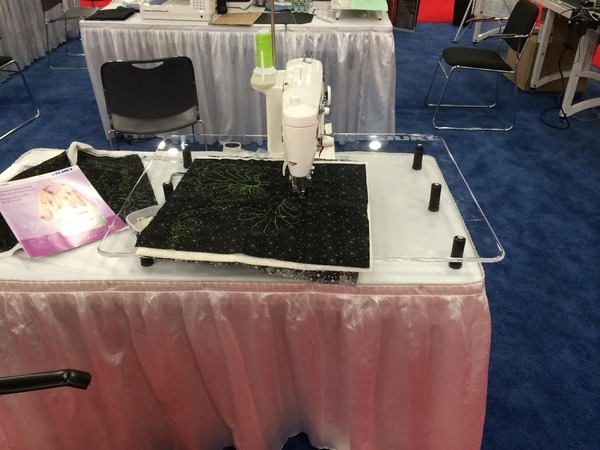 Comes with 8 removable legs, 2 16" cling rulers, and a silicone based Polish Kit which turns your Table into a slick surface ideal for free motion quilting. *Note: This table was designed for machines with free arms longer than 13”. If your free arm is shorter than this, this size of table may not be ideal as the needle will be more than 10” from the front of the table. CLEANING: Use only 100% cotton towel to clean surface of acrylic. Use a very small amount of sudsy ammonia diluted with water to clean. Other tested and proven cleaning agents are Sew Steady Polish Kit, Turtle Wax Paste and Goo Gone Gel. Similar untested products may work, but use at your own risk. CAUTION: Do not place anything hot on acrylic. Never have sewing machine arm lower than cabinet insert. Do not stand on, lean on, or apply unnecessary pressure, outside of standard sewing use, to acrylic. WARNING: Do not use harsh solvents such as Windex, rubbing alcohol, paint thinner, lacquer thinner, acetone, turpentine, or any petroleum based substances as they can cause acrylic to weaken and crack. If harsh solvents are used on acrylic the warranty is void. packaging for any return. Damaged items must be reported and have picture proof submitted within 15 business days of delivery date for no charge replacements. limitations or exclusions may not apply to you. 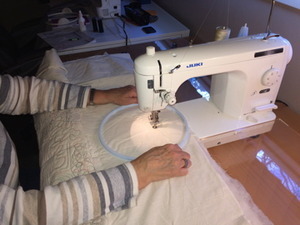 Sewing Machine arrived in excellent condition within days after placing order. Extension Table and Ruler/Template kit took a little longer but also arrived in excellent condition. I am very happy with entire order. Thank you! Nothing was mentioned that this table, while large, creates a significant amount of drag, such that free-flowing movement of the quilt is not possible. Yet the reason to buy this large extension table is to create a free-flowing surface to quilt large quilts. After discovering this drag (it arrived yesterday), I immediately googled to see if the problem was me, and it's not. Drag is inherent in the acrylic. This is not a reflection of Allbrands but it did result in disappointment. Had I been aware of this before the purchase, and a reasonable solution offered (Turtle Wax or the brand's silicone, which I have yet to buy), I would not have been taken off-guard. I just decided to look back at your website and discovered that you did in fact include the silicone polish - ah - but I didn't get it. I just called customer service (Sunday) and left a message. If it is resolved, and the silicone shipped, I'll change the Expectations from 2 to 7. Thanks. I am looking forward to receiving the table and ruler foot. I have received the cruise control, haven’t had a chance to use it but it is here. Thank you Barbara for keeping me informed on the shipping of all items. I will be ordering again from AlBrands because of the good customer service. So thanks to all of you for helping. Which Juki TL model number do you have. Are you using a Bernina #77 Adapter?